This is a very mixed street with stone cottages and pubs at either end, a couple of large 19thC town houses, several stout 1930s semi-detached brick houses in the middle, plus one 1960s brick bungalow and one modern but very fitting stone cottage built into a very tight corner. 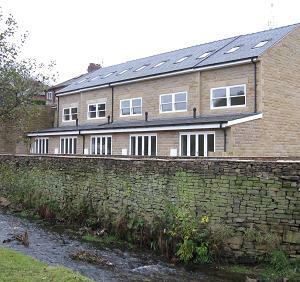 A terrace was completed in late 2009, known as Brookfield View, which is five 2.5 story three bedroomed terraced units in natural stone having fine views across Sowcar meadow into trees on the far side of the valley. Approach off the roundabout junction of Shrigley Road, Palmerston Street and Church Street. Leads to Willow Bank Drive and Foxglove Close, Brookfield View, Mill Lane, Smithy Brow, Blaze Hill, Spuley Lane and Oakenbank Lane. Nearest pubs – Poacher’s Inn, Cotton Tree and The Turners in the street; Church House round the corner in Church Street. Viceroy Indian restaurant in the street. Around the turn of the 19th/20thC Ingersley Road was known as Up Sowcar, pronounced Sooker. This refers to Sowcar brook and meadow which runs alongside the road. In the 1841 census Ingersley Road was called Sowcar Road. By 1861 it was Sowcar Lane. Finally in 1971 it became Ingersley Road on the census. More usually known today as Savio House, this name having been provided by the Catholic Order that presently occupies the property. Ingersley was the country home and estate of the Gaskell family. It was built by John Gaskell, a member of a successful local farming family, about 1774, before any of the major mills in the town. A video from James Hough. It starts by looking up Shrigley Road and pans round to Ingersley Road, then to Church Street, finishing at Palmerston Street. 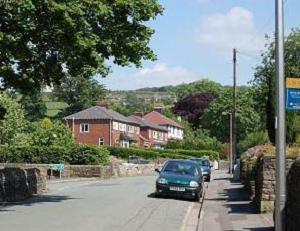 Conservation: Part of this street is in the Bollington Conservation Area. Numbers 7-13 are subject to Article 4 Direction. Sowcar Farmhouse ; II, early 17thC. Ingerlsey Hall (Savio House) ; II, Formerly Ingersley Hall now religious house: earliest house c.1775 for John Gaskell, remainder 1833 for John Upton Gaskell.